Global markets continued to chop around in April providing small gains for diversified portfolios. A modest rally in the Canadian dollar (CAD) versus the USD, subtracted from most foreign currency denominated ETF returns in April. Global equity markets were widely mixed in April as previously high flying US small-cap and tech stocks sold off sharply while Canadian and European equities posted gains. Japanese equities continued to lose ground. Global bonds were little changed in April, with Canada bonds outperforming foreign currency bonds in CAD terms. Emerging Market assets were little changed in April, as unrest in Ukraine worsened and EM growth forecasts continued to be downgraded. Gold and other commodity prices held relatively steady in April after strong gains in Q1. Energy prices weakened slightly as the WTI crude oil futures price slipped to $100/bbl at the end of April from $101/bbl at the end of March. Global growth forecasts have continued to edge down, led by a disappointing stall in US real GDP growth in Q1. Global inflation showed mixed signals, with inflation looking as if it might be bottoming in the US and Canada, but still weakening in Europe and Emerging Markets. Did April, with its choppy activity, provide the pause that refreshes? Or was it the calm before the storm? The Fed continued to taper its QE program despite stalled Q1 growth, lowering its bond purchases by another $10 billion per month to $45 billion. Fed Chair Janet Yellen maintains that policy rates will remain at the current low level as long as slack remains in the labor market. Members of the FOMC remain widely divided on how soon and how much the policy rate should be raised. The tailwind of a weaker Canadian dollar for Canadian investors in global ETF's reversed a bit in April. Bank of Canada Governor Poloz continues to signal increased confidence in a soft-landing for Canada’s inflated housing market and no interest in tightening monetary policy. The S&P500 closed April at 1884, up modestly from 1872 at the end of March and 1842 at the end of December. Global equity ETFs posted mixed returns in April. 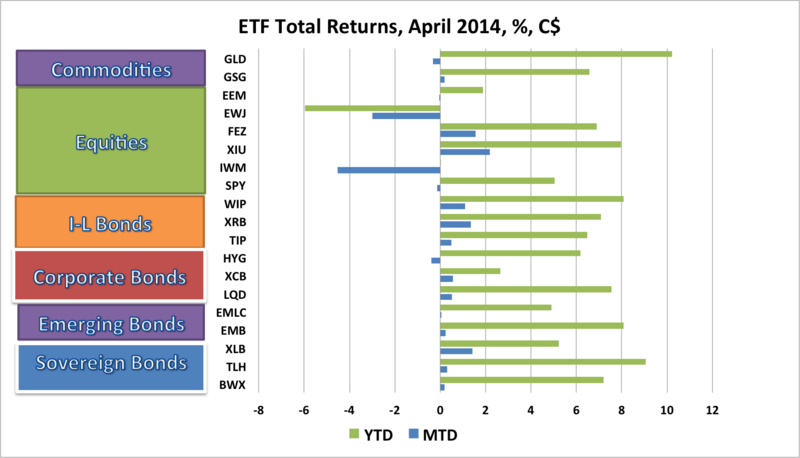 The C$ strengthened 0.7% vs. USD in April, lowering Canadian dollar returns on USD denominated ETFs. Canadian equities (XIU) provided the strongest returns among the equity DTFs we track, gaining 2.2%. Eurozone equities (FEZ) returned 1.6% in CAD terms, while Emerging Markets (EEM) were flat and other equity ETFs posted losses in April, led by Japan (EWJ) -3.0%, and the United States (SPY) -0.1% in CAD terms. US small caps (IWM) returned -4.5%, significantly underperforming US large caps. Commodity ETFs held on to year-to-date gains in April. The Gold ETF (GLD) returned -0.3% in CAD terms, while the GSCI commodity ETF (GSG) returned 0.2%. Global Bonds ETFs also turned in mixed performances in April. ETFs with positive returns included Canadian Long Government bonds (XLB), which posted a 1.4% return, the US long government bond (TLH) +0.3% in CAD terms, non-US government bonds (BWX) +0.2%, and USD-denominated Emerging Market bonds (EMB), also +0.2%. Emerging Market Local Currency bonds (EMLC), posted a 0.0% return in CAD terms. Inflation-linked bonds (ILBs) posted positive returns in April as inflation showed tentative signs of turning up. Canadian RRBs (XRB) returned +1.4%, US TIPs (TIP) returned +0.5% in CAD terms, and non-US ILBs (WIP) returned +1.1%. Corporate bonds also provided mixed returns in April as US investment grade (LQD) and high yield (HYG) bonds returned +0.5% and -0.4% respectively. Canadian corporate bonds (XCB) returned +0.6%. In the first four months of 2014, with the Canadian dollar depreciating 3.0% against the US dollar, the best global ETF returns for Canadian investors were in Gold and US long bonds. The worst returns were in Japanese equities. In global equities, the Canadian equity ETF (XIU) performed well, returning 8.0%. The S&P500 ETF (SPY) returned 5.1% in CAD terms. The Eurozone equity ETF (FEZ) returned +6.9% in CAD terms. Emerging Market equities (EEM), suffering from Fed tapering, political turmoil, and China’s growth slowdown, returning 1.9% in CAD terms. The Japan equity ETF (EWJ), hit by Yen strength and slowing Asian growth, returned -6.0%. US small caps (IWM), after a sharp selloff in April, returned 0.0%, underperforming the large cap SPY. Commodity ETFs turned in strong performances year to date for Canadian investors, aided by the depreciation of the C$. The Gold ETF (GLD) returned 10.2% in CAD terms, while the iShares GSCI commodity ETF (GSG) returned 6.6%. Global Bond ETFs, contrary to consensus expectations at the beginning of the year, performed well in the year-to-date through April. Foreign bond ETFs benefited from currency strength relative to the Canadian dollar and long duration bonds benefited from a combination of weaker than expected economic data and safe haven demand. The US long bonds (TLH) returned +5.5% in USD terms, but with the weakening of the C$, this translated into a +8.7% return in CAD terms. The Canada Long Bond ETF (XLB) posted a gain of +4.9%. Non-US global government bonds (BWX) fared better, posting a return of +6.7% in CAD terms. Emerging Market local currency bonds (EMLC) suffered from the same problems as EM equities, but still returned 4.7% in CAD terms. USD-denominated EM bonds (EMB) returned +8.0%. Inflation-linked bonds (ILBs) have rebounded the first four months of 2014 after a disastrous performance in 2013. Non-US ILBs (WIP) fared best, returning +7.5% in CAD terms. US TIPs (TIP) returned +6.0% in CAD terms. The Canadian real return bond ETF (XRB), benefiting from its long duration, returned 6.5%. In corporate bond space, the US investment grade bond ETF (LQD) returned 7.2% in CAD terms, while the US high yield bond ETF (HYG) posted a return of 6.2% as high yield spreads widened. The Canadian corporate bond ETF (XCB) returned of +2.5%. In April, the Canadian ETF portfolios tracked in this blog posted modest gains, adding to positive year-to-date returns. The traditional Canadian 60% Equity/40% Bond ETF Portfolio gained 67 basis points in April to be up 4.9% year-to-date (ytd). A less volatile portfolio for cautious investors, comprised of 45% global equities, 25% government and corporate bonds and 30% cash, gained 50 bps in April to be up 4.3% ytd. Risk balanced portfolios also posted modest gains in April. A Levered Global Risk Balanced (RB) Portfolio, which uses leverage to balance the expected risk contribution from the Global Market ETFs, gained 68 bps in April, boosting to its year-to date gain of 9.9%. An Unlevered Global Risk Balanced (RB) Portfolio, which has less exposure to government bonds, ILBs and commodities but more exposure to corporate credit and emerging market bonds, returned 32 bps in April to be up 6.0%ytd. Russia's actions in Ukraine have added volatility, but done little damage to major equity markets. Bonds, gold and the yen have benefited from their safe haven attraction. The situation remains a source of uncertainty and a significant geopolitical risk to markets. The Bank of Canada, with its policy rate decision and April Monetary Policy Report, confirmed that the direction of the next rate move will depend on growth and inflation developments. The economy is on track for growth in the 1.5-2.0% range in Q1, lower than the bank forecast in January. Nevertheless, Governor Poloz remains optimistic and global and Canadian growth will accelerate in the coming quarters. Core inflation remains stuck at just over 1% and is not expected to return to the 2% target until early 2016. Downside risks on inflation may have eased slightly, but the BoC will avoid any talk of tightening. In Q1, US and global growth were weaker than expected. Weather was partly to blame, but US growth, at 0.1%, was a full percentage point weaker than updated forecasts that incorporated the weather effect. Japan’s economy also posted weaker than expected Q1 growth and Q2 is expected to show a contraction in response to the April hike in the consumption tax. In May, signs of clear acceleration across the global economy will be needed to keep the consensus view on track. If the economic data fails to reaccelerate, the resilience in equity markets will continue to be tested. If data suggest a strong reacceleration, bond markets will be at risk. Concerns about low global inflation continue. Recent weak inflation readings in the Eurozone and China support ongoing concerns about global disinflation. Emerging markets remain a focus. China's exchange rate has been allowed to weaken against the USD as Chinese exports and manufacturing activity remain sluggish and housing activity slows. Russia’s economy is suffering from tightening sanctions and private sector capital outflows and is vulnerable to a drop in crude oil prices. Political uncertainty remains in India, Turkey and Brazil. As it turned out, major equity and bond markets drifted sideways again in April as global uncertainties persisted. Evidence of a pickup in global growth is now badly needed. US corporate earnings growth slowed in Q1, so even the slight gain in the S&P in April pushed equities further into overvalued territory. The risk now is that stronger economic growth reverses the bond market rally and, at the same time, equity multiples reverse. 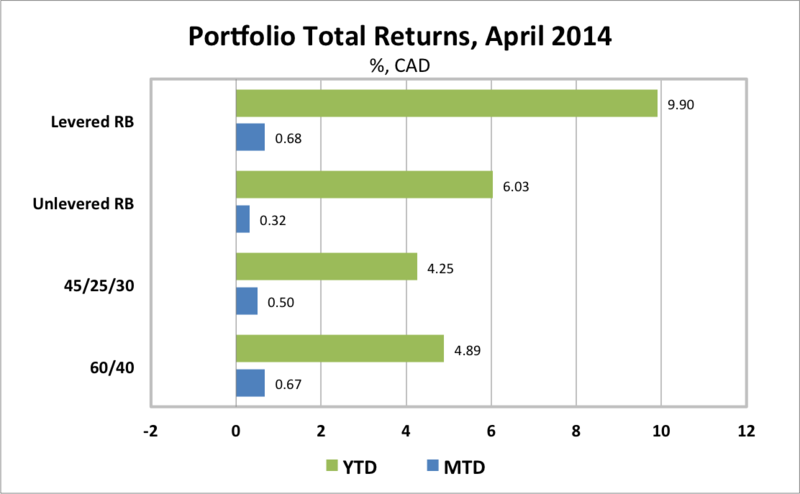 Having ample cash in the portfolio was a prudent strategy in April and remains so in May.